With the exception of the first column, AutoHotkey does not allow direct editing in a GUI ListView control. That forces us to create separate editing controls for changing and updating content in any of the other columns. We can either add the controls to the same GUI as in the AddressBook.ahk script (shown below)—discussed in my AutoHotkey Applications e-book—or we can create a second GUI which pops-up on demand. Since putting all the controls in the same GUI creates less confusion for the ListView functions (the functions always operate on the default GUI), you might find the AddressBook.ahk example easier to implement for your application. However, for the sake of doing something different (and to get a better understanding of the ListView control), here, we create a second GUI window just for editing the LegalInput.ini data table. In this alternative two-window approach, keeping track of multiple GUIs sets up the challenge. This blog demonstrates how to modify the data within the ListView control. Next time, we’ll alter the routine to simultaneous update the data table INI file. Note: I posted the working LegalListView.ahk script at the “ComputorEdge Free AutoHotkey Scripts” site. This file shows how all the code discussed in the first three blogs of this series integrates into the app. I’ll update the script as I add more blogs to this series. The next three Gui, Add, Edit commands set up editing fields for the short definition (ShortDef), the Latin term (Latin), and the long description (LongDef). The Submit button (Gui, LV_Edit:Add, Button, , Submit) initiates any updating action. We add the Gui, LV_Edit:+OwnerLegalList option to prevent the editing window from disappearing behind the ListView window when we click or make a new selection in the main GUI. The +Owner option ties the smaller editing GUI to the larger main window. Whenever you minimize or show the main window the owned window follows suit. Double-click on any row to open the editing window. Clicking the Submit button saves the changes to the ListView but not (yet) the INI data table file. The built-in variable A_EventInfo contains the row number whenever the double-click Gui Event occurs. Using the LV_GetText() function, AutoHotkey retrieves the text from each column in the selected row. Then, using the GuiControl command, we insert the ListView text into the editing fields. Note that the script calls out the name of the editing window (LV_Edit) for each instance. This may save confusion in more complex AutoHotkey scripts. Now that we have placed the row data in an editing window, how do we update the ListView with any edits? Our LV_Edit GUI includes a Submit button for saving the changes. For now, we’ll only renew the ListView table values and save updating the INI data file for next time. That means the changes only take effect on the screen. Reloading the file returns the data to its original form. The LV_Modify() function uses the saved values to update the text in the ListView. You should consider this a temporary update. 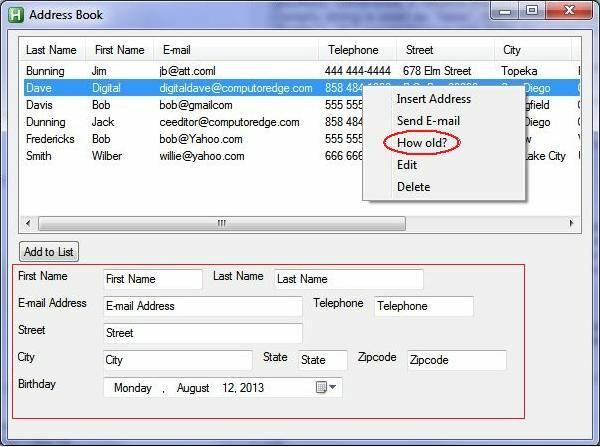 Although the changes immediately appear in the ListView window, AutoHotkey does not save them to the data table file. That requires the IniWrite command—which I plan to discuss next time. For now, reloading the script wipes out the changes. After clicking a ListView column header, AutoHotkey finds the selected row and scrolls it into the visible portion of the GUI. Next time, we’ll use the IniWrite command to directly update the data table file.